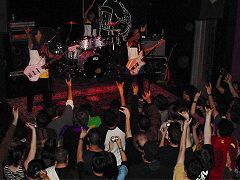 Members of the Shonen Knife appeared on the stage with enthusiastic applause starting “KONNICHIWA”. They were in perfect condition also today! They were going on with their steady performance. Naoko asked the audience, “Have you tried our new album, Heavy Songs yet?” following “A Map Master” and some new songs. When the song, “Rubber Band”, started, the place really came alive with shouts, “rubber band, rubber band, rubber rubber rubber band!” accompanied. The tension at the place reached its peak by the last song, “Cobra VS Mongoose”. In a storm of applause, they played “Antonio Baka Guy” as an encore finally. The sound was so cool! The Shonen Knife is touring with the Modey Lemon from Chicago through Toronto on Oct.30. 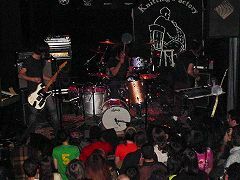 Two day acts at The Knitting Factory, Manhattan, NY from today. Usually a live performance of the US and Canada makes up of a main act and some front acts, not like that of Japan. Secret Weapon (above), Hang On The Box and the Modey Lemon. Secret Weapon is a band with three women in costume of the same cloth. The sound of them is influenced by American punk bands of ante-grunge rock. Their fresh act was received warm applause from everyone at the venue. With the sound of Mango Juice”, members of the Shonen Knife appeared! The venue was almost full with 400 people excited by the enthusiastic performance of previous bands. 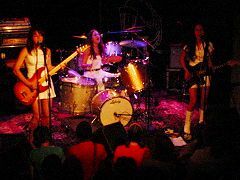 The Shonen Knife leads the audience firmly with the first song, “KONNICHIWA”. New songs, “A Map Master”, “Ah Ah Ah” and “Golden Years of Rock ‘n’ Roll” were popular impressively. It was a performance of a great presence polished by live experiences of this tour with seventeen songs through encores, “The Top Of The World” and “Banana Chips”.